Improve Your Posture & Balance. Strengthen Your Feet & Legs. All Levels. All Regions DVD. 105 minutes. 18 barre exercises. 1 floor stretch. Earn up to 73 FJ Rewards. Here is the perfect introduction to the ballet class for those who have never studied ballet or haven’t danced since childhood. This class is based on Finis Jhung’s sold-out classes for adult beginners at The Ailey Extension in New York City. Get away from the world as you get in touch with your body. Learn how to do the basic movements that are the essence of ballet dancing. Each exercise is first shown and explained in detail by Finis and then it is demonstrated by Sachiko Kanai while Finis stands by and coaches. The CD music is by Scott Killian. “5.0 OUT OF 5 STARS. CLEAR INSTRUCTION. —Christopher E. Reid. March 16, 2019. *Workout mode is available only for hard-copy DVDs at this time. “I’m in my 50s and have danced for fun and exercise since college. For years, my go-to favorites have been Kries’ New Body Ballet, Lowe’s The Ballet Workout and Argo’s The Anti-Aging Method. Needing a change, I ordered Ballet Barre for the Adult Absolute Beginner and loved it right away because it engages my mind. Finis Jhung explains the movements and helps you understand why each is important. I use a portable VitaVibe 4′ barre to do the 18 exercises then the brief floor work. The sessions can be played with or without instruction and the exercises can be played one by one. * Jhung even explains how best to hold your arms which I’ve always wanted to know (Exercise #6). The music is peaceful & unintrusive. This DVD has the detailed type of instruction I’d been craving–longer, focused, and helpful in improving my balance. I also have Beginner Ballet Barre and am looking forward to the third in the series Ballet Barre Stretch & Strength. Mr. Jhung suggests in Beginner Ballet Barre to do this DVD Adult Absolute Beginner first. I would agree because “Beginner Ballet Barre” appears to have more complicated exercises, also well-explained. Very pleased with my purchase! *Some features mentioned not available for streaming videos, only hard-copy DVDs. “Here is my story–and one you might relate to… I am 69 years old and in pretty good shape. I work out on the treadmill. Do machine/weight workouts. I take walks. I dance to music around the house. Nothing major or heavy duty. I am stiff in the knees, hips, and back. I wanted to add something to my workout routine to help combat the stiffness. Yoga and pilates are nice but I wanted to try something different–and ballet was something I always longed to do since childhood. I love the idea of ballet–the music, the art, the discipline, the whole package. “This fall, I attended ballet classes at my workout facility. Turns out it was an advanced class–not a good match for my skill level but it was a start/an intro. I attended about six sessions. Two takeaways from the experience: 1) Ballet is right for me. 2) Finding an appropriate instructor/class is a key requirement and worth the search. But what to do? I searched for local beginner-level classes. Nothing jumped out at me in terms of offerings and/or scheduling. I also began searching on YouTube for beginning ballet videos. I found a few…some good…but alas, nothing that really suited. Then…and much to amazement…I found Finis Jhung. “I am a long-term lover of ballet, but as a practitioner I am an adult beginner, with absolutely no prior experience. Like the recent reviewer, I have checked and researched what was available online and public library. Originally, I was NOT really going to buy the DVD by Finis Jhung – mainly because of the price (I am a student, and I don’t usually spend $40 on a single DVD). However, upon reviewing other beginners DVD options and looking at Finis’s website, watching the clips of his various DVDs and reading reviews, I made a decision to take the risk. “The short story: Within a month of starting to work with this DVD, I invested in another one; that is how much I have grown in my esteem of Finis’s teaching. and his dry wit will make you chuckle along as you practice. “An unexpected but very welcome result is mental/emotional: I feel very relaxed after practicing with this DVD. “At 66 I am just starting to study Ballet. I have no previous music or dance training to draw on. After considerable reading of beginning ballet material in books and online, I discovered that four beginner ballet videos or teacher videos were repeatedly recommended: any DVD by Finis Jhung – I selected Ballet Barre for the Adult Absolute Beginner by Finis Jhung with dancer Sachiko Kanai- 2014 DVD; Ballet Class for Beginners with David Howard- 1982 VHS/DVD; Ballet Workout by Melissa Lowe 1984 VHS/DVD; and Ballet 101, A Beginners Class by Jennifer Nunes- VHS/DVD 1997. I read that any Finis Jhung DVD is pricey compared to the rest and are virtually never found online for sale at a discount. I purchased all four of these programs from Amazon in DVD format. I find that Finis Jhung’s DVD is by far the best choice for the true adult beginner! 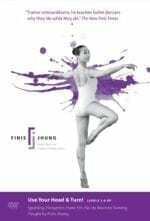 The Finis Jhung DVD has a detailed list and individual description of each of 18 exercises with time and tempo on the jacket cover. None of the other three DVDs have any listing of tracks on the jacket cover. Nor was any insert placed with within the jacket to provide a listing or description of the tracks. 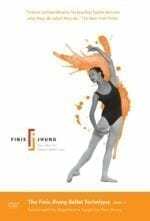 I feel that Finis is directly and most successfully targeting the new Adult Ballet Beginner Student. The other three DVDs I purchased and viewed were originally recorded in VHS format in the 80s and 90s, and then apparently transferred directly into DVD format without any updating of material. None of the DVDs had technical improvements in individual track accessibility equal to the refinements in Finis’s DVD. Finis teaches in the program himself and he really teaches! He tells you what the reason is for having “knees bent” or “ears up” or always trying to be “in number one.” In his quietly supportive and confident speaking style, Finis tells you the reason why you have to make a specific movement in a specific manner. 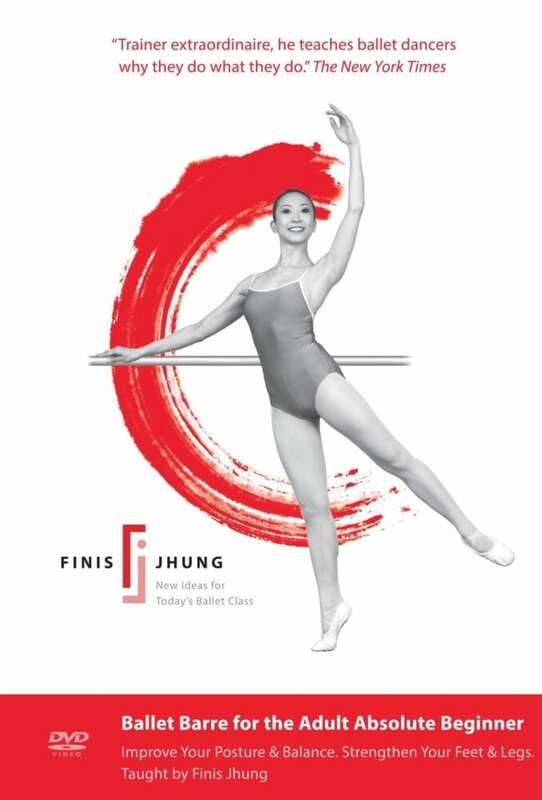 After purchasing and viewing four different teaching systems’ introductory ballet DVDs, I have concluded that the The Finis Jhung program is the only one of the four that is technically and actively supported in the present by the originating artist. And it is updated new today for the target audience I absolutely belong to: The Adult Absolute Beginner!